ONE of the most mysterious things in space just got even weirder. Fifteen new fast radio bursts have been spotted – all from the only source of these that we have ever seen repeat. Fast radio bursts (FRBs) are some of the universe’s strangest phenomena: powerful radio signals that flash from distant space for milliseconds and then disappear. They have been attributed to everything from black holes to aliens, but there’s no clear explanation yet. Because they are so brief, and because radio telescopes can only watch a small area of the sky at a time, only about 60 of these bursts have ever been detected. Over half are from the only source ever seen to repeat: FRB 121102, which is in a dwarf galaxy about 3 billion light years from Earth. Now, researchers with the Breakthrough Listen initiative, a $100 million search for signs of intelligent life in the universe, have detected 15 more pulses from this famous repeating source. 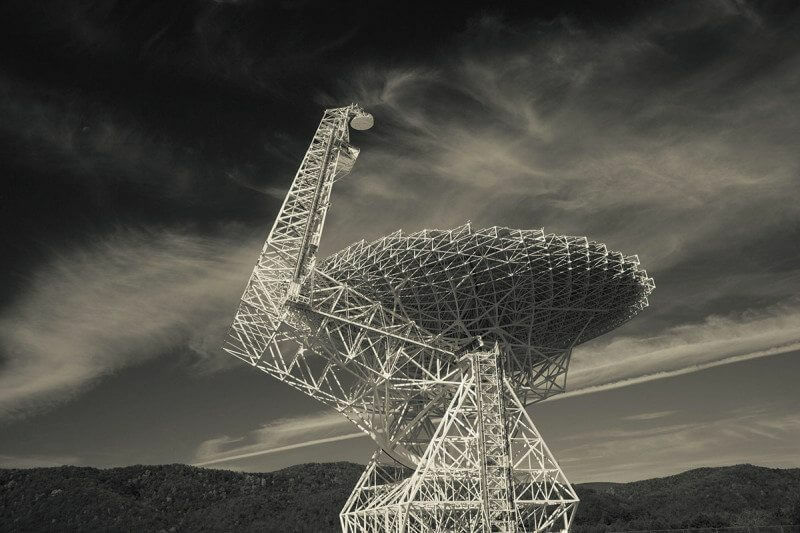 These signals were at higher frequencies than any fast radio burst we have seen before, and about twice as high as previous measurements from this source. It’s still unclear how that could influence our explanation of these elusive events, but researchers hope it will help narrow down the possibilities. “Previously we thought there wasn’t much emission at high or low frequencies, but now it looks like there is,” says Avi Loeb at Harvard University. This wider frequency range could make repeating FRBs easier to detect. Each radio telescope only looks at a narrow frequency range, so radio bursts across a wider range mean that more telescopes can find them. Finding more is crucial as we currently have only one to base our explanations on. Right now, we can only see FRBs that are a certain distance from Earth, due to the expansion of the universe and the redshift it produces. As distant objects are accelerating away from us at a higher rate than closer bodies, we see the light they produce as shifted into the lower-frequency red part of the spectrum. So, a radio telescope designed to listen to only lower frequencies is limited to observing pulses from relatively distant objects. Loeb says that if these bursts occur at a wider frequency range, we will be able to detect FRBs that could be far closer or further than those we have spotted before. If all FRBs were repeaters, the observable universe would light up with one pulse every second (arxiv.org/abs/1706.06582). The next radio telescopes could be able to detect more than one FRB per minute, especially if repeating FRBs can emit radiation at several different wavelengths, Loeb says. But the new observations make it seem even less likely that all FRBs repeat – no others have ever been seen to repeat, or to flash at such high frequencies. Instead, it adds another layer of weirdness that could make the mechanism producing these cosmic bursts even harder to pin down.